So far in the series, Putting the YOU in YouTube, we’ve discussed personalizing your channel, uploading your videos, and trimming out the parts of your videos that you don’t want. In this post, we’re going to look at using the tools within the YouTube Editor that will help you put your mark on your movies. In the Editor, you can bring videos together to make one longer video, you can apply filters to your video clips, add music, titles, and transitions, as well as insert still photos into your video. The image below shows what each of the icons in your “Options Menu” represent. The Video Editor is very easy to use because it is a simple “Drag & Drop”. You’ll start by dragging all of your video clips you want to include in your movie onto the row of the workspace for the videos. To add additional video clips, drag the clips down to the workspace and “drop” it beside the clip you’ve already placed. You can click the Creative Commons icon to access video clips that have been licensed under the Creative Commons that you’re free to use in your own videos. If you have still images you’d like to incorporate into your video, you can click the camera icon. You’ll then be prompted to either upload images from your computer, or you can import pictures from your Google+ account. 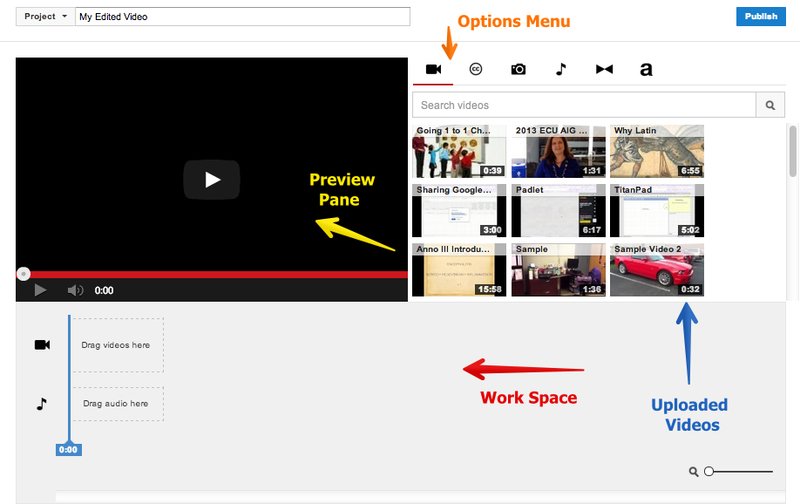 Once they’re displayed beside the preview pane, again, just drag and drop them where you want them to go in your video. When you drag a video clip (or any of the other options) onto the workspace, you’ll be able to edit those clips or elements further. Below is a screenshot of what your screen will look like when you drag a video clip onto the workspace. Notice that you’ll have the ability to make some quick fixes which include zooming in and out, change the brightness, stabilize, rotate, etc. You can also add text to your video clips. Be careful with this, however, because if you add text here, it will display the entire time your video clip is playing. If you’d rather just add a title text or a “slide” of text between videos, you use the text icon from the original Editor menu. Keep reading to learn more. To get back to the original Editor menu, simply click in the gray area of the workspace, or click the x in the upper right-hand corner of the clip editor. The music icon will allow you add Creative Commons music clips to your videos. Although there is a volume bar where you can tell YouTube to favor either the sound from the original video clip or the music, the music always seems to be louder than the sound from the video. So just be careful and consider which is more important, music or sound from your video. At this point, there isn’t a way to assign music to only certain portions of your video either. You’ll drag the music clip onto the workspace under the videos and images. Also, there is currently no way to upload your own music files…more than likely copyright issues. To add titles and/or transitions to your movie, you click and drag the type of title or transition you’d like onto the workspace where you want them to go. When you drag the element down to the workspace, you’ll see a blue line appear to show you where the element will be added. You’ll need to be careful with the titles because if the blue line highlights the entire video clip, that means that title will play the entire length of the clip. If you only want it to show before or after the video clip or image, you’ll want the skinny blue line. To get back to the original Editor menu, you’l usually click the x in the upper right corner. However, for some reason, that “x” isn’t present on the transitions menu. To get back to the Editor menu, you can click in the gray area of the workspace. If you decide that you don’t want an element in your video after all, or any element for that matter, you can hover your mouse over that element. A small x will appear in the upper right-hand corner of the gray bar. Simply click the x and that element will be removed from your workspace. You can also reorder an of the elements in your video by clicking and dragging it to where you want it to go. Once you’re video is like you want it: all of your video clips are in the correct order, you’ve added any desired still images, you have transitions between the elements to make it flow smoothly, and you have inserted all the necessary title slides, it’s time to publish. Directly above the preview pane, you can rename your video, then on the right-hand side of the screen is a blue “Publish” button. Depending on how long your video is, how many transitions you’ve included, and if you decided to include music clips, it may take your video a little while to publish. The beauty of the Editor is that until you publish, all of your work is automatically saved. So if you don’t have time to finish your video in one sitting, you can log out of YouTube, come back to it later, go to the editor, and all of your work is still there. When you publish, you’ll then have a blank workspace again. Did you miss the first three post in the series Putting the YOU in YouTube? Check them out!